Electric scooters (scooters) have taken the transportation world by storm this past summer. 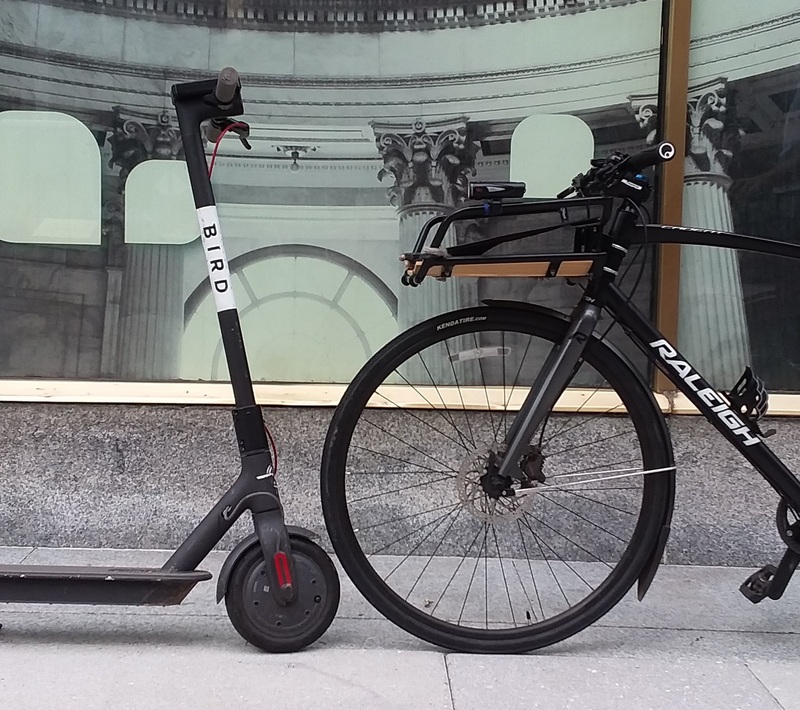 Companies such as Bird, Lime, and Spin have launched scooter share services in many cities. These services seem to be both wildly successful and controversial. In California, we have begun to see state action to define and regulate these new modes of transportation. Scooters are likely a very positive development for bicyclists because they provide another alternative to car transportation and do not pose a substantial risk to the safety of bicyclists. By bringing more people out of cars and onto sidewalks, bike lanes, and shared use paths, the bicycling movement’s interest in better infrastructure is strengthened. This article explores what it might look like if scooters, by law, became bicycles – or at least were treated as bicycles in the way that electrically-assisted bicycles are treated in many states or in the way that Maine treats roller skis as bicycles. Below is a table that looks at 12 topics that are covered in our Bike Law University series and considers how scooters, and similar vehicles, fit within those topics – and what actions might be necessary to adapt bicycle-related laws to include scooters. These are quick and initial impressions that could help as states and cities debate how to regulate scooters moving forward. Is Action Needed to regulate scooters or provide them rights? These laws are currently specifically written for vehicles passing a person on a bicycle. For scooters and similar vehicles to get the same protection these laws would need to be modified. Absent such modification, general “safe distance” laws may apply to scooters and similar vehicles. High, scooter riders deserve the same safety and legal protection. Yes, current laws likely do not apply to scooter riders. These laws are not widespread for bicyclists at the state level. As written, they often provide that bicyclists are given the same rights and duties as pedestrians on sidewalks, bicyclists owe special duties to pedestrians on sidewalks, and bicyclists have rights on crosswalks. These considerations would seem to apply to scooters and similar devices. High, scooters appear to be hybrid vehicles like bicycles, operated on the road at times and operated in shared use environments with pedestrians at times. Failing to provide rights and duties applicable to both circumstances creates substantial legal uncertainty for both groups. Yes, fewer than half of the states have statewide rules for how bicyclists should behave on sidewalks and this uncertainty likely extends to other vehicles. Improving the consistency of these laws may address public uncertainty regarding proper behavior. Bicycles are treated as vehicles for one or both of two reasons: 1) they are included in the vehicle definition, and 2) their operators are given rights and duties under a separate statute. This treatment is important so that when bicycles are operated in the road they are owed the same duties as vehicles and follow the same rules unless more specific rules are provided. The same motivations would apply to scooters and similar devices that are operated in the road. High, scooters should be defined as vehicles so that their riders are given the rights and duties of drivers as our traffic laws are written for drivers with supplementary rules as states see appropriate for other modes of transportation. Likely, while I have yet to see a 50-state compilation of how scooters are regulated it is likely that definitions and regulation are far from uniform if they explicitly exist in most states. These laws generally provide rules for how bicyclists should position themselves on a roadway, based on the concept that slower vehicles should operate to the right side of the road to facilitate passing by faster vehicles if doing so is safe. These laws are currently written specifically for bicyclists in many states. Scooters operate at speeds similar to bicycle speeds and the logic of this type of law would also apply to them. High, public sentiment suggests that people believe scooters are unregulated and unpredictable. Likely, while the utility of “where to ride” laws can be questioned they express society’s judgment of how lower speed vehicles should be ridden safely. These laws are generally conceived to encompass as many vulnerable road users as possible, but generally include an enumerated list of people who fit that definition. New mobility devices may not be included in existing laws, but clearly fit within the concept of this type of law. Our model law includes a person operating a scooter or a motorcycle, but does not specifically include an electric scooter. High, scooters face traffic risks in the same way that other vulnerable road users (VRUs) face those risks. Maybe, existing VRU laws typically give a list that may include scooter riders. Any states considering VRU protections should include scooters in their enumerated list or a catch-all term that can be adapted for small mobility devices going forward. These laws modify rules for proceeding through a red light and/or stop sign, often based on lack of detection when a traffic signal must detect a vehicle to change. This lack of detection concern would appear to apply to scooters and similar devices, although the need is less applicable if scooters primarily operate on sidewalks. Medium, if scooters are used on the road then there may be vehicle detection issues that justify “dead red” laws. The electric assist of scooters makes the energy conservation rational of stop-as-yield laws less applicable. Maybe, “dead red” laws provide a relief valve from poor infrastructure, but the ultimate solution is better vehicle detection systems, which are now widely available from many Intelligent Transportation Solutions providers. Bicycling under the influence laws clarify how DUI laws apply to a person operating a bicycle, sometimes by providing lower penalties. The motivations for this type of law also likely apply to scooters which are similarly lower speed, less inherently dangerous, vehicles that may not pose the same public health problems as DUI. Debatable, scooters may be more likely to be defined as vehicles or motor vehicles, meaning DUI laws may be more likely to clearly apply under current law. Debatable, if public policy supports intoxicated people using scooters not being punished at the same level or in the same way (e.g. points on a driver’s license) as intoxicated drivers then laws may need to reflect that. Laws that authorize local regulations tend to provide broad authority to local governments regarding the regulation of bicycles. Local governments may want the same authority to regulate scooters or similar devices. For bicyclists, local regulation means that rules may vary as they pass through jurisdictions on a ride. Debatable, scooter regulation appears to be localized and non-uniform. However, scooters may not be used over as long of distances as bicycles, making it less likely that conflicting local regulations may be problematic for scooters. Maybe, if public policy supports states limiting authority or providing guidelines for local authority. Uniformity is generally believed to promote shared understandings of proper and safe behavior. All state laws that require the use of helmets while riding a bicycle only apply to persons 18 or under riding bicycles. There is great debate about the utility of mandatory helmet laws, but the motivating concerns about safety and the countervailing concerns about discouragement would seem to apply to scooters and similar devices. Debatable, one reason to be concerned about discouraging bicycling – discouraging healthy physical activity – may not be as applicable to scooters. However, scooters may impact public health by improving traffic safety if they reduce car trips. Debatable, both the utility of mandatory helmet laws and scooter use can be questioned so it is difficult to know how to weigh safety and discouragement. These laws provide rules for drivers and vehicle passengers opening doors into oncoming traffic, making it clear that the person opening the door is responsible for any injury. As written they likely do not need to be modified to extend the protection to people on scooters. High, there is no reason for the law to treat bicyclists and scooter riders differently in this circumstance. Not in most states, all but 8 states have dooring laws and they should protect scooter riders as written. Where dooring laws do not exist, they should be enacted. Share the Road license plates generally support bicycle advocacy organizations or agency programs that publicize safe bicycling. It’s possible that scooters have similar constituencies and they fit within the “share the road” message. Medium, “share the road” plates directly benefit bicycling-related programming in many states, but scooters also “share the road.” Wisconsin provides funds from its “share the road” plate to motorcycle programming, so there is precedent for other groups using this type of plate and message. Likely not, it only makes sense to make a change if there is demand for a plate and organizations or programming to be supported by plate revenues. Where they exist, mandatory use laws require bicyclists to use bike lanes or paths. The motivating concerns for these laws would appear to apply to scooters and similar devices. High, the motivation to separate road users by law would seem to apply in the same way to scooters and bicycles. No, mandatory use laws became disfavored after mandatory side path provisions were eliminated from the Uniform Vehicle Code in 1968. This was because bike lanes and paths do not provide a complete system and may not be appropriate for all bicyclists, particularly high-speed bicyclists. They should not be reinvigorated by scooters.